George Ivanoff is the award-winning author of over 60 books for young people, including some titles on the reading list for the Victorian Premier’s Reading Challenge. According to his website, Gamers’ Quest, Gamers’ Challenge, Life, Death and Detention and Real Sci-Fi, are on the Y7 & 8 list, and Books 1 & 2 of the Gamers trilogy are also on the Year 5 & 6 reading list. 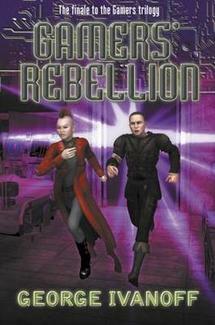 Although I haven’t read those ones, I expect that Gamers’ Rebellion, Book 3 of the Gamers Trilogy, will be on the updated list for next year: it’s the kind of book that appeals to kids who like computer games and it’s well-written. I have to be upfront and say that speculative fiction is not a genre I really like. But I’ve read a few (A Wrinkle in Time by Madeleine L’Engle, for example, and Gillian Rubinstein’s Space Demons and Galax-Arena) and I know that if anything’s going to lure a certain type of reader away from the computer screen, books in this genre will do it. The world that’s been created in Gamers’ Rebellion is a convincing one, full of digital devices, cloning, teleporting and all that sort of techno-stuff, and the characters – an assortment of real people and clones – interact in a dynamic way. Gamer’s Rebellion also offers the possibility of interesting discussion with students. Tark and Zyra have spent their whole lives as the playthings of a game designer who likes playing god. (I have to admit to enjoying this myself when I play Sid Meier’s Civilisation). ‘When I first developed the Game it was simply an exercise in creation … I have studied creation myths from across the globe … There seemed to be an element of amusement in most of them. As if in life, death, everything was for the entertainment of the specific deity 0r deities. When this original designer (with the rather prosaic name of Robert) abandons his responsibilities to Designers Alpha and Beta, exploitation is moved up a notch to become really evil. I think that classes will enjoy teasing out the subtleties of this ‘playing god’ scenario, but religious schools may need to take care how the discussion is framed. This plot is exciting, and the characters are sufficiently complex for the reader to be not quite sure who’s on which side for a while, which heightens the tension. I expect this to be a popular book in my school library. This entry was posted on July 13, 2013 at 11:24 pm	and is filed under Book Reviews, School Library stuff. Tagged: Gamers ' Rebellion, Gamers Trilogy, George Ivanoff. You can follow any responses to this entry through the RSS 2.0 feed. Both comments and pings are currently closed.